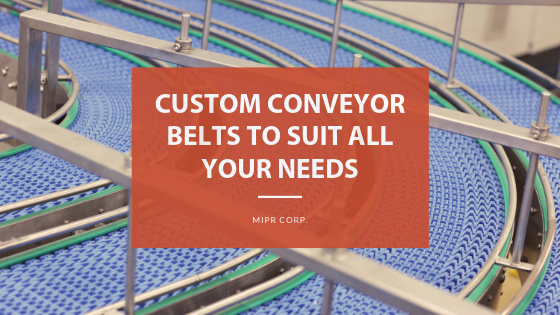 First and foremost, MIPR Corp conveyor belt experts are creative—and quick!—problem solvers. Our case studies show how 40 years of experience, a comprehensive range of products, and same-day sample shipping keep companies all across the country moving forward. 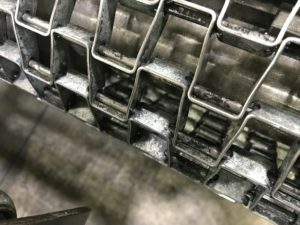 Our engineers recently took a call from a frustrated factory owner with an ongoing problem on a tire-shredding recycling line. Their facility featured an outdoor-to-indoor conveyor belt. Employees working outside stacked old tires on a conveyor belt that carried the tires up a 30-degree incline into a warehouse where they were tipped into a chipper. The problem? Even in fine weather, tires tended to slip back on the incline and fell off. Add rain, snow, or ice, and the frequent production slowdowns were starting to impact their bottom line. Here is another stainless steel belt that MIPR Corp has supplied a customer that has worked out very well in both high temperature and corrosion. Customer did not have a stainless steel belt in place before and this solution provided by MIPR Corp is working out very well in their corrosive environment. Solving belting problems since 1980. For over 40 years, the engineering experts at MIPR Corp have helped customers in critical, high-impact environments design, manufacture and deliver conveyor belts. Recently, MIPR Corp helped one lumber company protect their production line while making a powerful leap in production volume. A sawmill of international lumber, needed to make a big jump in volume without breaking the bank upgrading their production line. As their load scaled up from 3,000 to 7,000 logs per day, they needed a smart and cost-effective solution, fast. This sawmill operates a whole-tree, bark-on, lumber saw mill. It is a powerful, high abrasion operation running six days a week. A break in a conveyor belt that requires a changeout brings the line to a halt for 24 hours—costing the mill time and money. MIPR Corp designers and engineers have confronted challenges just like this for over 40 years. MIPR Corp installed a much heavier duty conveyor belt to prevent future breakdowns. As speed and volume picked up in the sawmill, conveyor belts weren’t keeping up. Worn belts catch and break, damaging products, stopping production and lowering profits. MIPR Corp engineers recommended a better belt covering for their type of business—one with the top-rated cover for strength and resistance. This simple step cut the number of belt-related production delays in half, ensuring that higher production load would mean higher profits for the company. What is holding your business back? For a FREE evaluation of the critical components of your production line, from conveyor belts to bellows, call the experienced engineers at MIPR Corp. We solve problems, save you money and help you succeed. We’ve told you about the different ways MIPR Corp’s environmentally friendly and cost-effective used conveyor belting can be used once its time on the production line is done. But there’s one that means more to us than all the rest—and it’s very close to home. Like many of you, the hardworking team at MIPR Corp spent this morning sending our children off for another year at school. It’s exciting, and emotional, and we can’t wait to get home and hear about their first day in their new classrooms. For our own Whit Lee, however, it’s even more so. His two young children attend a school with a playground filled with bridges and climbing walls built out of MIPR Corp conveyor belt. “Even before they were old enough for school, my son and daughter loved to go play at the local elementary school playground,” Whit explains. They weren’t alone—the playground is a popular destination for many children in the area. A group of neighborhood parents had recently formed a playground committee to oversee a much-needed renovation of this much-loved space. The budget was tight, child safety standards are high and resources and materials were at a premium. Whit generously donated MIPR Corp new & used conveyor belting to the playground renovation. MIPR used belting is age-cured, durable and environmentally friendly. The kids love it, and their parents and teachers love the lessons it teaches them about re-using and recycling. After another gorgeous Maine summer, Whit’s children are headed back to school—and back to chasing their friends around a playground made possible by MIPR Corp.
There’s a reason why MIPR Corp takes on any conveyor belt system challenge with confidence—our team’s 34 years of hands-on experience and proven expertise set us apart from other conveyor manufacturing companies. With one call, our clients receive innovative, affordable and workable plans the next day (or the same day)—and get right back to work. 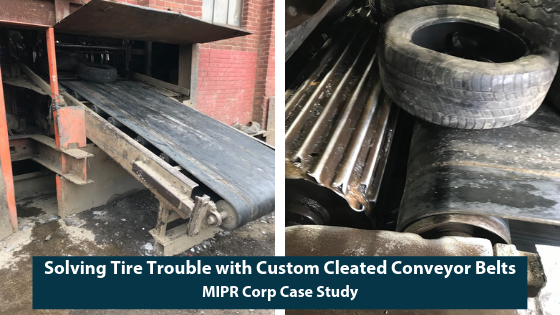 When a major manufacturer of custom auto parts ran into conveyor belt issues on a critical section of their line last year, they called MIPR Corp. A recurring jam had brought their business to a halt and they needed a solution that would stick, fast. Our conveyor belt engineer diagnosed the difficulty right away: their previous supplier had failed to account for incline when they had designed and installed the conveyor belt. At this juncture in their assembly line, expensive custom auto part components were sliding down a steep incline on an improperly surfaced conveyor belt, bumping into each other, damaging goods and throwing the construction process into disarray. 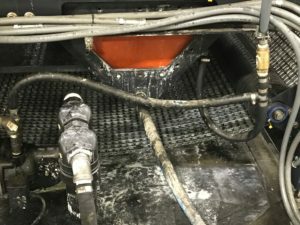 This company’s reputation for quality and service was on the line … and MIPR Corp was there to get the plant back online. It took our conveyor belt engineer less than a day to discover what was wrong and just one day to fix it. In less than 24 hours, MIPR Corp designed, sourced, delivered and they installed a very sticky, rough top industry standard conveyor belt directly to the manufacturing plant. Everything was back to running smoothly. Because MIPR delivered so quickly, our client was able to make their big delivery, too. Do you have a conveyor belt section that isn’t running as smoothly as you would like? Have a manufacturing challenge you think a custom conveyor belt might solve? Bring MIPR Corp your conveyor belt questions and industrial supply problems. We have the answers, cost-effective solutions, premium products and superior service you need, right now. Conveyor belts and casters are essential to keeping today’s supermarkets and grocery store chains running smoothly. Our supermarket supply customers rely on MIPR Corp’s conveyor belt expertise for sourcing, service, and installation—and we’re also the clear choice for casters. Without the right casters, bakery and oven racks jam and grocery carts grind to halt. MIPR Corp supermarket supply engineers know how to keep your market on track. With over 30 years of experience, we can identify the exact right caster for any job or any application right away. With six national distribution centers, we can provide same- or next-day service on our supermarket casters. And we stand behind every caster we sell with impeccable repair and customer services. MIPR Corp specialize in stainless steel oven rack casters that resist rust and frozen bearings in even the most demanding, high use environments. Our oven rack casters need much less maintenance than typical casters and can give your oven and bakery racks a service life up to four times longer. MIPR Corp is a supermarket’s one-stop supply shop—we also stock, service and supply the parts, axles, bearings or wheel replacements you rely on every day. MIPR Corp is the perfect supermarket maintenance supplier for huge national chains and for small boutique markets. Cut down on maintenance costs. Avoid downtime. Keep your employees productive and your customers profitable. When you need supermarket casters, call the company that always knows what you’re talking about—and always knows exactly how to help. Contact MIPR Corp today for your next supermarket maintenance needs!